Kadir became infuriated by her independence, and Jannat confided to her family that he had drugged, beaten and raped her. She was forced to give up a college course and driving lessons. Shortly after their second child was born, Kadir kicked her in the stomach after a caesarean section, causing the stitches to open up. … The abuse continued, and in early 2011 Jannat made her final bid for freedom, telling him he couldn’t return. Two days later she was seen dropping her daughter off at school. An hour and a half later Kadir rang his brother to say: “I’m in trouble.” Jannat had been strangled with her own scarf. Samantha Sykes, 18, and Kimberley Frank, 17, were killed on 9 March 2012 in a flat in Wakefield. Ahmad Otak was found guilty of their murder and sentenced to life imprisonment. Otak came to the UK from Afghanistan to claim asylum in 2007. He said he was 15 and was placed in a children’s home, where he met sisters Elisa and Kimberley Frank, who were then 13 and 12. Elisa and Otak formed an on/off relationship that continued when they both left the home. [W]hen Frank left Otak for the first time in 2011[,] he threatened to throw acid in her face, sew up her mouth and petrol-bomb her mother’s house, Sykes reported Otak to the police and to the UK Border Agency. “But nobody ever challenged Otak about his behaviour,” said her mother, Julie Warren-Sykes. The article was about feminists who are campaigning to make the government “take action to stem the rise of violence against women by keeping a database of every woman who is killed by a man.” The same feminists will, of course, be firmly in favour of mass immigration by Muslims and other non-Whites. But are even liberals at the Guardian starting to glimpse the truth about ethnic enrichment? 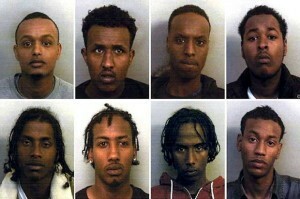 Thirteen men, all of Somali origin, have been convicted of the systematic sexual abuse of vulnerable girls as young as 13 in Bristol and officers are investigating claims against 49 other suspects. The victims, some of whom were in local authority care, were groomed and passed around by their abusers — often for money — and assaulted in homes, parks and a hotel. One of the girls was raped at age 13 on the same night by three different men, including a stranger, and thought her life would be in danger if she went to the police. Another girl was sexually exploited after a local authority outside Bristol set her up alone in a flat at the age of 16 in a deprived inner-city neighbourhood although she had been described as having the emotional development of a three-year-old. Two days before her death, Victoria Adams, 22, told friends that Andre Bright, 30, had thrown a bottle at her and degraded her by spitting in her face and taunting her that he was going to sleep with her friends. 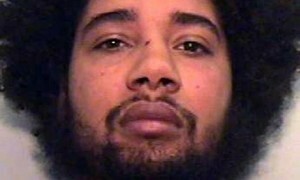 Bright’s abusive behaviour culminated in returning to her home in Oldham, Greater Manchester, where he fatally stabbed her in the chest and abdomen with a kitchen knife. Bright was shot with a Taser by a police officer at the scene and, when warned he might be shot again, he said: “I enjoyed that. You need more volts in your Taser.” Opening the case, Mark Kellett said Bright and Adams had been in an on-off relationship since 2007 and had a young daughter, born in August 2013. On 5 December that year Adams had her first night out with friends since her daughter’s birth, the court was told. I don’t think the Guardian is turning into a White nationalist newspaper, but something interesting has happened to its reality filter. The truth about ethnic enrichment is occasionally slipping through. And when liberals start admitting the truth about race, who knows where it will end?